Same as GL24WM except solid door The GL24WMS WM Series Wall Mount Rack/Swing Out Enclosures provide 19" EIA 310-D compliant mounting in a distribution . A simple snap latch located inside the cabinet opens the 18.00" deep center swing section. The center swing-out feature provides outstanding front and rear access to cables and equipment. 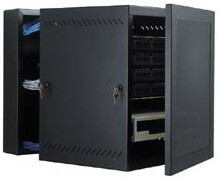 The reversible cabinet mounting design makes left or right-hand swing-out possible. This convenient feature also conserves valuable wall space. Knock-outs sized for 1", 2", and 3" conduits and fittings are located at the top, bottom and rear for easy wiring, installation, and maintenance. Front and rear sections lock independently for added security.